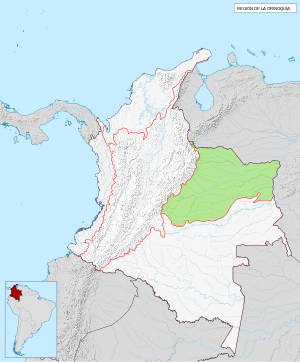 The Orinoquía region is one of the five natural regions of Colombia that belongs to the Orinoco River watershed. It is also known colloquially as the Eastern Plains from the Spanish Llanos Orientales. The region covers most of the area of the departments of Meta, Arauca, Casanare and Vichada. The ecosystems of the region are tropical savanna with gallery forests and wetlands along the rivers.